This afternoon I discovered a bloom of Physostegia virginiana (Obedient Plant) rising up through a mound of Nepeta ‘Walker’s Low’ (Catmint) in the northern border. For a couple of years I have been battling this native plant, one that was well-behaved in my previous garden. Given to me by a dear relative many years ago, I brought it along to the current garden cheerfully, believing it to be a wonderful plant. It blooms in late summer when few other things can be so readily counted upon. It charms everyone, young and old, by having bendable flowers—when touched they remain in the position they are bent (thus the name Obedient Plant). Though it remained well-contained in my old garden, in the much richer prepared soil of my current one, this perennial starting establishing itself too heartily, spreading by rhizomes throughout the entire northern border. It seems a shame to pull out something that is so pretty and so enjoyed by this bee, but I guess I will have to toughen up and remove this plant or face the consequences. Fortunately the bee should be able to find some other nourishing plants within the same border. 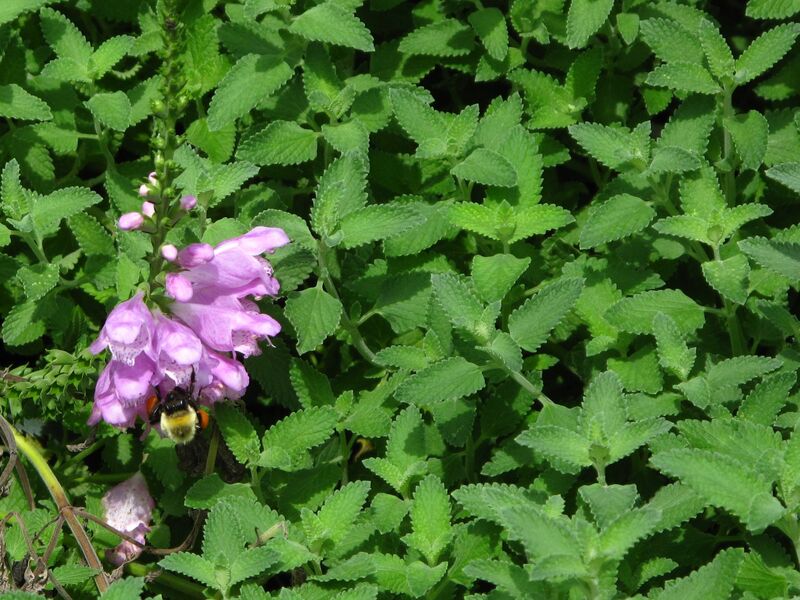 This entry was posted in garden and tagged invasives, native, nature photography, Nepeta 'Walker's Low' (Catmint), Obedient Plant, photographing nature on August 20, 2012 by pbmgarden. Love that bee-from afar. We had lots of obedient plants confined to one area back in July-not one bloomed. I like that bee too! Too bad the plants didn’t bloom for you. That’s an interesting plant! I’ve never heard of that before. I’m sure there’s still plenty around for the bee elsewhere though… I know how quickly some things can spread! I used to like it. It grows to about 4 feet tall. My garden is full of plants that spread too quickly. Take care. I have problems with Physalis… the roots are incredible! Kerri, from Colors of the Garden sent me some a couple of years ago, and it is doing quite well. In fact, it is just getting ready to bloom. This fall, I am going to relocate in to the field, though. It can spread all out there. 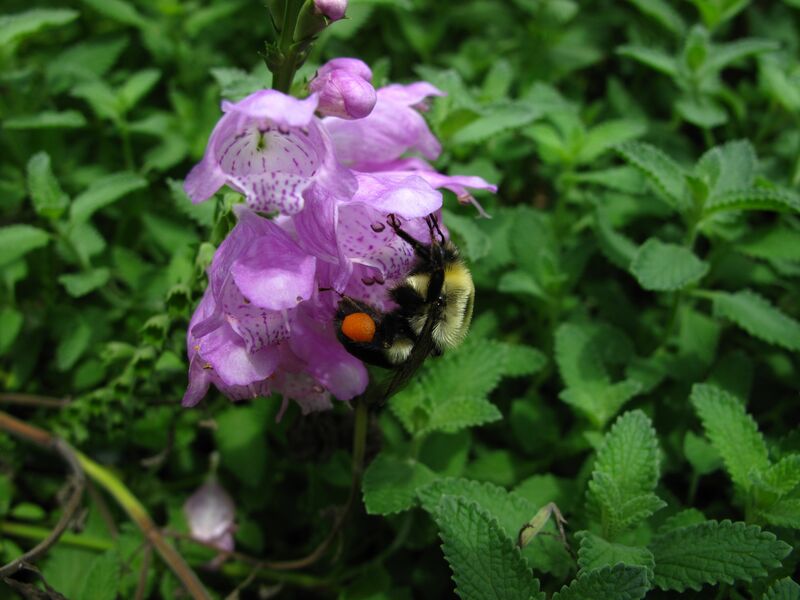 Your field might be a perfect place for Obedient Plant. It certainly never was a problem at my other garden (mostly shade there and heavy clay soil). We grow these from seed here and have a white one in flower at the moment. Lovely plants. Bet the white is nice. I’m sorry to have to give mine up.